After seeing a simple script on ubuntu.onego.ru to share files on Dropbox using an icon in the Unity launcher, I though I'd update the Dropbox Share script I've created a while back to do something similar, but more advanced: just like the regular Dropbox Share, you'll be able to share both files and folders and also you can share multiple files at once. Even though this was created for the Unity launcher, it should probably work with other docks like Avant Window Navigator, Docky, DockBarX or Cairo Dock too (I've only tested it with AWN). An emblem is placed on the files / folder you share and a NotifyOSD notification is displayed when the files you've shared have been uploaded to Dropbox. Links to the files you share are automatically copied to your clipboard. To unshare the files you need to remove the links from your Dropbox public folder (Or use Dropbox Share which also comes with an Unshare script) - I couldn't figure a way to do it from the icon. Tip: if you remove some files you've shared from the Dropbox public folder, you can update the emblems by simply clicking the Unity Dropbox Share icon (you may need to refresh Nautilus using CTRL R). 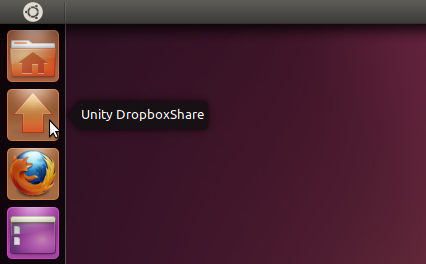 The Unity Dropbox Share icon isn't automatically added to your Unity launcher (I couldn't figure for a way to do this - no, using Gsettings doesn't work as it can't be ran with "sudo") so you'll have to add it manually it: open Nautilus and navigate to /opt/unity-dropbox-share/, then drag and drop the icon to the Unity launcher. If you have a suggestion / bug to report, let me know in the comments! You can also submit bugs @ Launchpad. Credits for Dropbox Index which is used by Unity Dropbox Share: kosciak1.